Are you part of the Little RED Church Community? If you are a member of the Little Red Church Community we want to add your profile to our website! Enter your information using the form below. Please check your listing before you submit it as it will be posted as listed. The website is updated once a week, so it may take some time before your profile appears on line. The Little RED Church Community Profile pages are for people actively offering events and services. Thank you! If a person wanted to contact you for more information about your services or to book an appointment, how would they get in touch with you? This is where the Quick Teaser Description of Your Groovy Offering comes in. For more information, click here. (clicking on the link will take the viewer to your event page). The picture to the left will be replaced by the Picture of You (first picture) that you submit through the forma. Then we'll create your very own profile page with the Full Description of your offering, when you're available at the Little RED Church and Your Bio. Your Profile page will look something like this (or you can click here to see it in action!). This is where the Full Description of Your Groovy Offering goes. Here, you'll tell everyone all about the fabulous things you're offering at the Little Red Church and why they need to come and check you out! The picture here is the Additional Picture or Logo that you submit. This is where Your Groovy Bio goes. 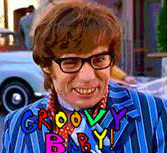 Tell us about you and why you do that Groovy thing you do! You might want to include your past experiences in your industry and education. The picture here is the Photo of You that you submit.